Are you annoyed that after Windows Update installs upgraded software and patches, it keeps asking you to reboot your computer? If you don't stop it, it even automatically shuts your computer down so you could lost valuable work that you forgot to save. 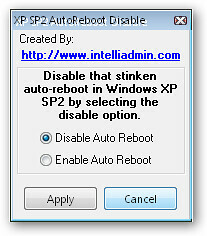 IntelliAdmin has created a very simple tool that lets you disable the automatic reboot "feature" permanently. Auto Reboot Remover simply asks you whether you want to enable or disable automatic restart. As another way, if you'd rather disable the reboot reminder manually every time it shows up, you can go to the command line (Start->Run and type in "cmd"), and type in "net stop wuauserv". This only works for 24 hours though.